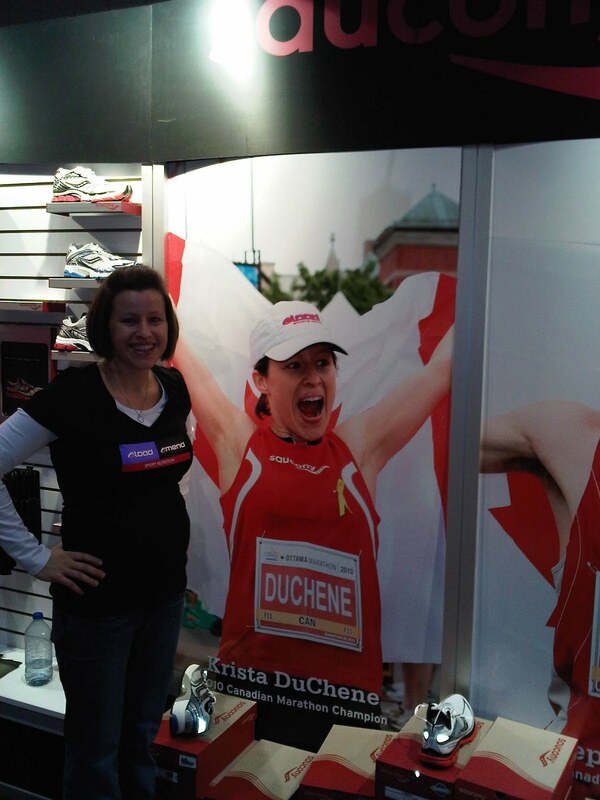 Yesterday I had the opportunity to be at the Eload and Saucony booths at the Scotiabank Toronto Waterfront Marathon. I was surprised to see my full-sized picture with Stephen Drew on display for Saucony. In May we won the National Marathon Championship, well-representing Saucony. AND, on the Eload pamphlet, there is a picture of myself and Simon Whitfield. Two great companies to represent, that is for sure. It was great to get to know Sharon and Douglas while answering questions and giving samples to runners at the expo. I met Reid Coolsaet’s mom, whom I’m sure is proud of her son today – he was Canada’s first finisher AND qualified for London 2012! Eric Gillis was not far behind him, and Katherine Moore was Canada’s first female. My friend Matt also had a great race – finishing with a 6 minute PR. Way to go, folks! I’ll tell you, being there really made me realize (again) how much I love running. Boy will I be excited to get back at it after this baby arrives!